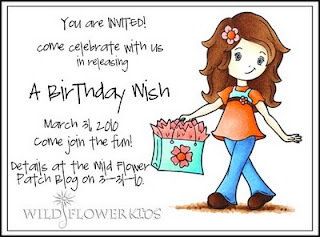 Jen has designed a fabulous set of birthday images for this release..we gonna love them all. She is one of my favorite WFK cutie .. I used 7Gypsies and a little strip of Cosmo Cricket Material Girl papers for this one. 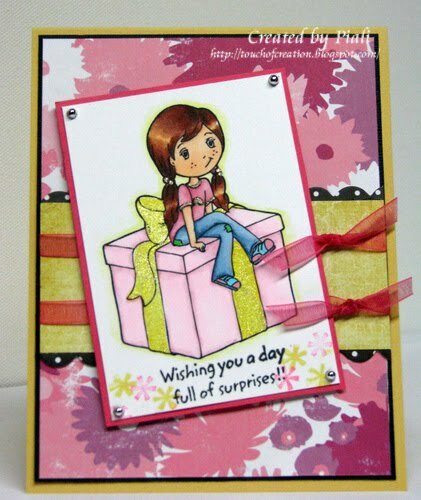 A simple card using 365Card's~ Super Sketchy Sunday Sketch... added some ZVA Creative florishes for a special celebration. The sentiment is from Hero Arts.. I made a Gift Card holder ...its a easy peasy one, I made is template long ago and like to use it a lot. 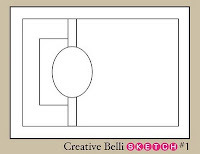 Its also for this week's Just Us Girls template challenge..
Make sure to link your entry HERE by midnight CST April 6th, 2010. Make sure to check all fabulous DT creations.. make sure leave some love at each stop .One Lucky will win the entire Release set ...how cool is that!!! 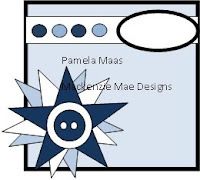 Next stop is our super talented Yvette's blog. WFK Sneak Peek & Sale Alert!! So please join us tomorrow...here is a sneak peek of whom you will meet there.. 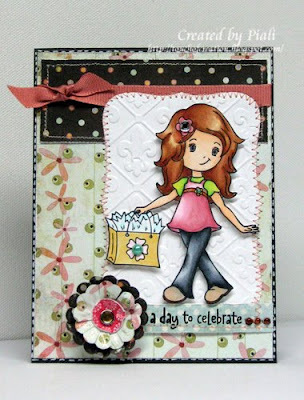 I used Karen's wonderful sketch and Making Memories ~ Just chillin paper for my card today...Sweet and simple one. 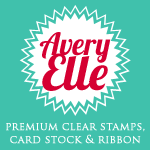 Hope Stamps Eternal is having a Fab sale, now through Wednesday March 31 take 15% off with the code STPAT and through Saturday April 10 take 25% off Bella Blvd and Imaginisce no code required! 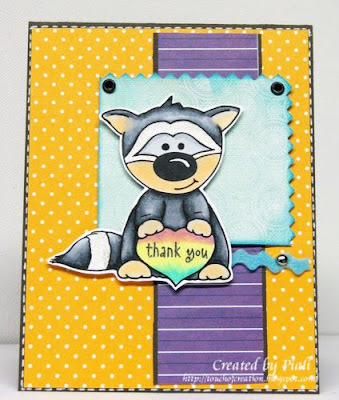 Stamptacular's Build-A- Card Blog Hop.. 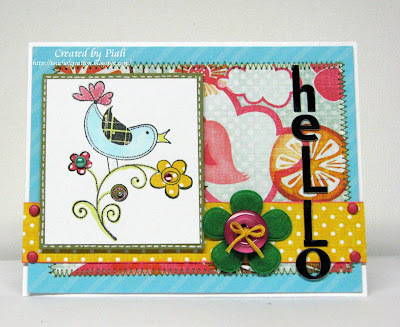 Welcome to Stamptacular's first Build-A-Card Bloghop.. 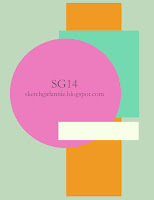 If you are here from our super talented DT sister JANNEKE'S blog you're on the right track ....but if you're joining me just now, please go to SSC blog to start your adventure so that you don't miss any step. You're almost done! So what could you possibly add now? You'd think this would be a hard one and that by now you've added everything you could imagine...but NOPE. I have the perfect addition for you...some sparkle! PERFECT! 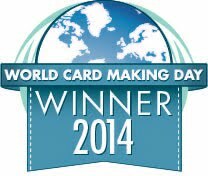 You have one more stop to make before you're BUILD-A-CARD is finished. Please jump to it and see what PRISCILLA has waiting for you at her blog! Before you go, here's another chance for you to win an extra prize! 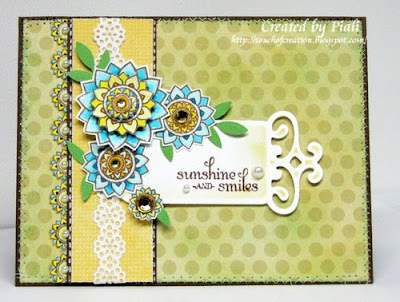 Leave me a comment and let me know what you like MOST about our Stamptacular Sunday Challenge? I have used the sweet Greeting Farm~ Darling Sister stamp and beautiful Basic Grey~ Green at Heart papers for my card today. This is one of my fave new GF image. 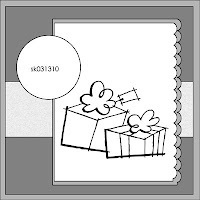 White cardstock is embossed with Cuttlebug Fleur de Lis embossing folder..the border punch is all time favorite EK Success Embossed curve punch. Papers: Basic Grey ~ Green at Heart, Bazzill. Stamps: The Greeting Farm ~ Darling Sisters, Verve stamps. Copics, EK Success embossed curve border punch, Cuttlebug fleur de lis folder, white gel pen, ribbon, bling. Its time for Stamptacular Sunday challenge ...its my last card as SSC DT...so its a special one. 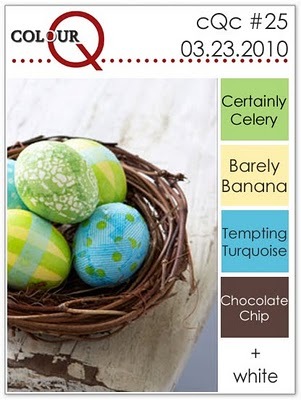 Create a project with oodles and oodles of flowers and only use bright and cheery spring colors! 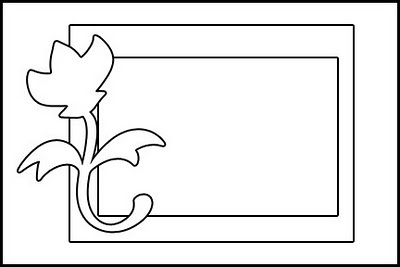 Verve stamps: Fun with Flowers. Paper make up stamps: be inspired by the sun. 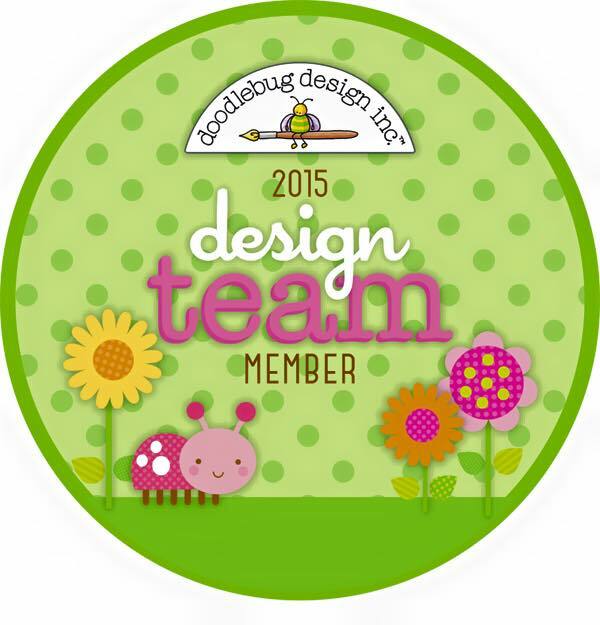 So play along with us to win a fabulous All Night Media "Go Team " stamp set sponsored by our DT sister Sarah..
Don't forget to join us for the Stamptacular Anniversary Bloghop ...its starts from 6:00 AM EST. Papers: DCWV, K & Co., Bazzill. Copics, Martha Stewart leaf punch,Nesties~ Fancy labels, Recollection pearls and blings, sewing machine/thread, K & Co paper lace, white gel pen. Here is my this week's PIO DT card.. 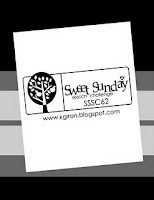 This week we have a lovely sponsor 2 Cute Rubber Stamp... I'm a big fan of Heidi's super cute stamps...they are available as digis also. One random participant will be picked from the entries this week to receive a FREE RUBBER STAMP from the 2 Cute Ruber Stamps Vintage Cute Collection! Secret crafter Saturday Challenge: Pink , Green and Flower. Stamp something: Doodle something...I've doodle around the main image with white gel pen. 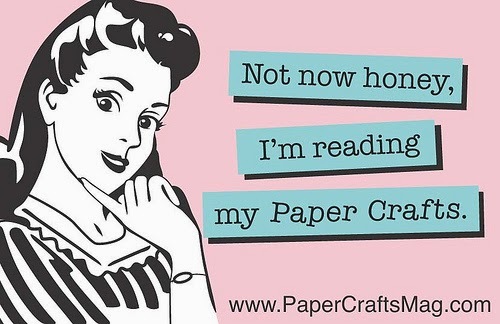 Totally Papercrafts: Pink and Green. Pollycraft Challenge - Sparkly things... I've a glittery Bunny but poor photography ..
Colour Create: Your choice of Pastels. 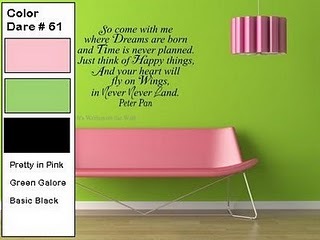 Color Dare:Pink ,Green and Black. 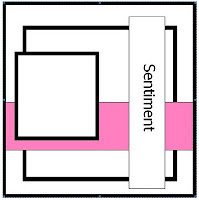 Fun with Shapes and More: Faux Stitching...on the sentiment banner. Practical Scrappers - Something you've had for over a year... The paisley DP is really old. Handfull of stamps:You're a sweet one. Charisma cardz: Spring has sprung. Digital Tuesday - Happy Spring + digi. TGIF!! Its almost the end of March..this month went by too fast! 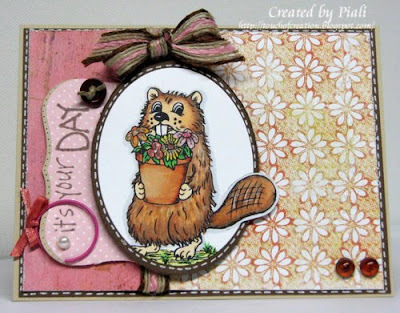 I used BuckE Beaver for my card today..love this guy....Cute!! Practical Scrappers: Use something that you got over a year ago..the Just ribbon is more than a year old, never used it before. Make sure to check out CAFE blog for this week's ANYTHING BUT A CARD challenge . Fairy Jocelyn and Hoppy Frog images as well as a $5.00 Gift Certificate for The Cafe Store, a Winner's Blog Badge, and winner's blog featured in the Winner's Section of the Store. The Character Cafe DT call is open now..if you wanna play with these super cute images , check HERE to apply. Papers: Basic Grey~ Green at Heart, Bazzill. Copics, Nesties, Ribbons, Button, Dew Drops, paper Clip, White Gel Pen, Pearl. 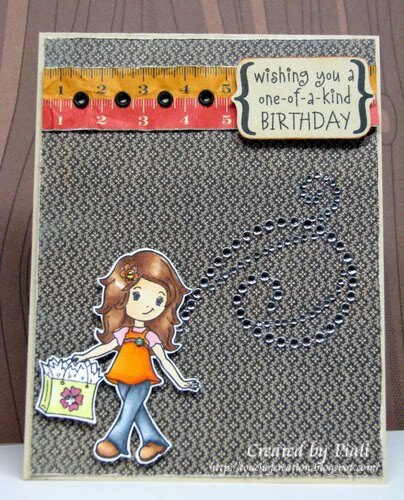 Labels: colour create, crafty calender challenge, creative belli, funwithshapes, Hope stamps Eternal, just add ink, practicalscrappers, thecharactercafe. Its time for this week's Dare to Be Sassy Thursday Challenge.. Here is my take .. 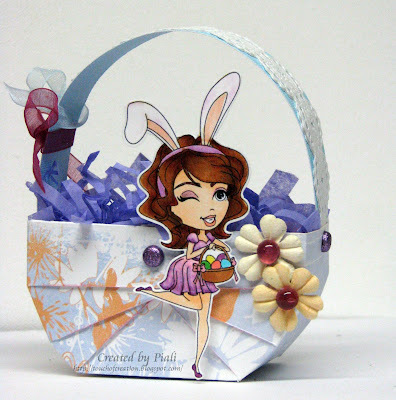 I love this Easter Bunny image...cute and fun. I used Basic Grey ~ Kioshi and Memory Box~ Frond papers for this card, soft pastel shades of these papers are perfect for a spring card. I heat embossed the easter eeg border with a $1 Studio G stamp ...the sentiment is also from Studio G.
Crazy 4 challenges: Spring card. 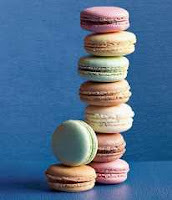 Allsorts challenge: Spring is in the Air. Stampin' B: Purple, Green and Yellow. If you would like to play along with this challenge...You will have until next Wednesday 3/31, at midnight PST, to get your entry in! Make sure to use a SASSY STUDIO image and link your creation HERE ... A winner will be announced on Friday 4/2 The winner will receive their choice of 2 SSD images!! 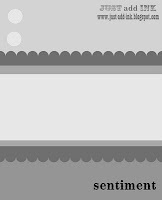 Papers: Basic Grey~ Kioshi, Memory Box~Frond , Bazzill, Neenah white. Copics, Martha Stewart Butterfly punch, Stampendous black embossing powder, Recollection pearls and blings, sewing machine/thread, Ribbon. 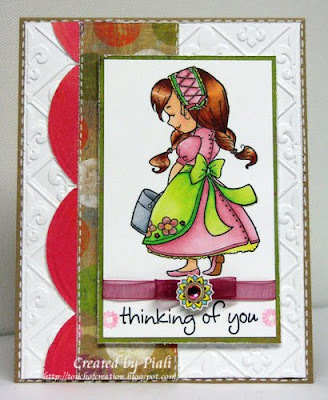 As you all know by now I'm the Guest Designer of Pixie Cottage stamps this month ....here is my second Pixie Cottage creation. This week's challenge theme is super fun!! 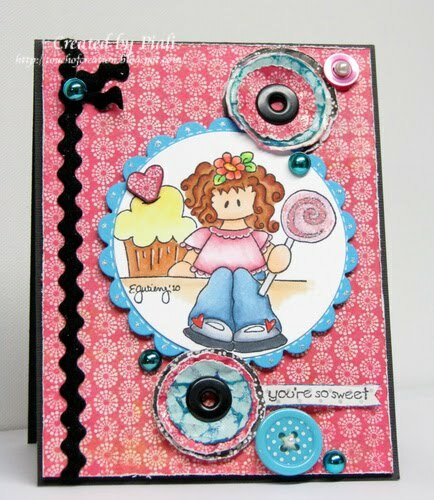 I used Sweet Molly stamp by Eileen Gutierrez for this card . 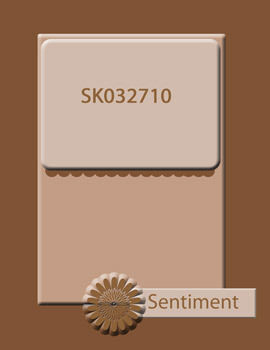 This week's TPE sketch is just perfect for circle theme....paired it with Kelly Jo's color combo. Love this sweet image and I think the card came out cute!!! 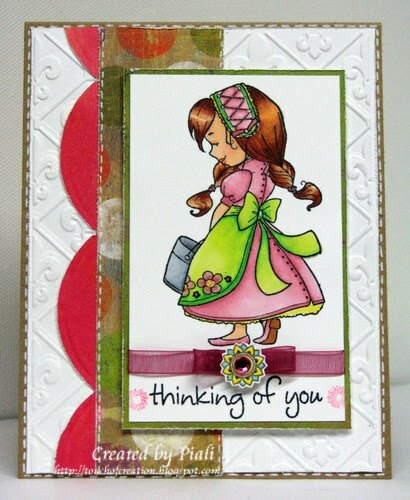 To join the fun please post a direct link to your circle creation HERE by April 4th .... One entry, drawn at random, will win a their choice of two lovely Pixie Cottage Stamps. Pixie Cottage is also offering digital stamps now...check it HERE . Papers: Basic grey ~ Green at Heart, bazzill, Neenah white. Copics, Spellbinders, Ek Success circle punches, Ribbon, Buttons, Dew Drops, Making Memories Large eyelets, Crop-a-dile,White gel pen. 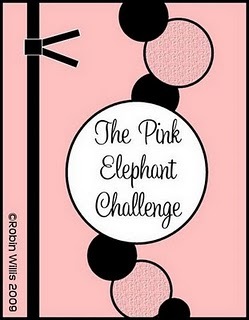 This week Jen has a lovely challenge theme for us.. 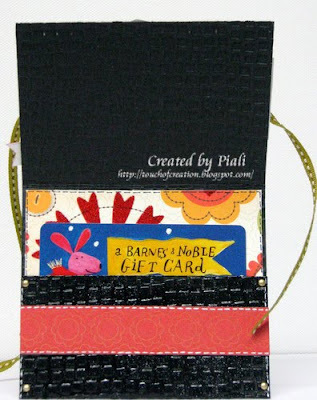 Create a project or card that uses ribbon and handmade flowers… none of those store bought flowers. Meet Birthday Ivy.. she will be available in WFK store on march 31st.. Jen's magic worked again, she has designed a bunch of adorable images for forthcoming WKF Birthday release..check back later for more sneak peeks.. I have used fabulous Basic Grey ~Kioshi papers for card and the flower...simply punched scallop circles, made tiny cuts for the petals and added a brad to finish my flower. La La Land crafts: Make your own flowers. Penny's Paper crafty challenge: Birthday..
Creative Card Crew: Going Dotty..
To play along post your card or project on your blog or online gallery with the tag WFWC7 and add a direct link to project HERE by midnight CST March 30, 2010. Papers: Basic Grey ~ Kioshi, Bazzill, Neenah white. 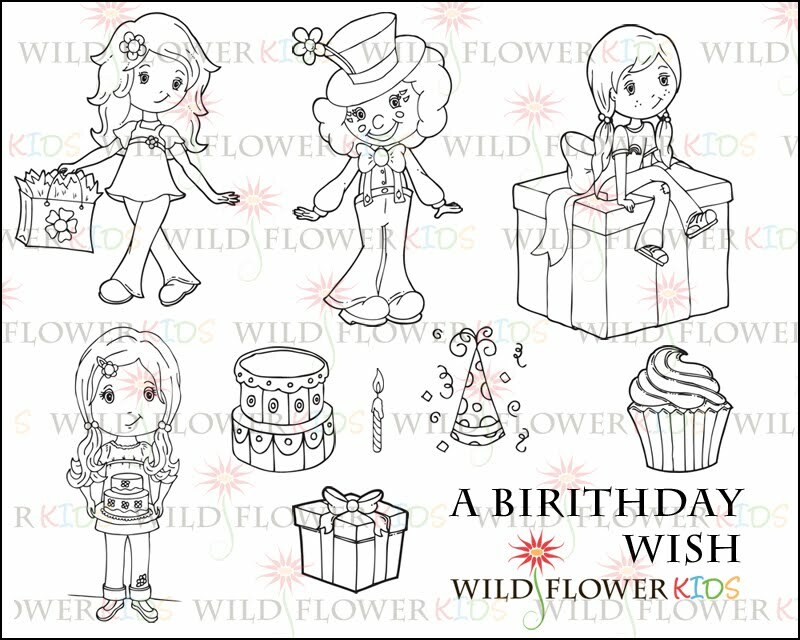 Image: Wild flower kids stamps. Copics, Cuttlebug Fleur de Lis embossing folder, Ribbon, sewing machine/thread, jeweled brads, ZVA creative pearls, white gel pen, Nesties. 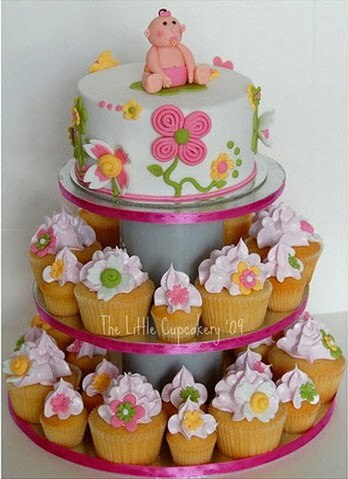 I'm back with a beautiful Cupcake for this week's Cupcake Inspiration Challenge #51 CIC51.. 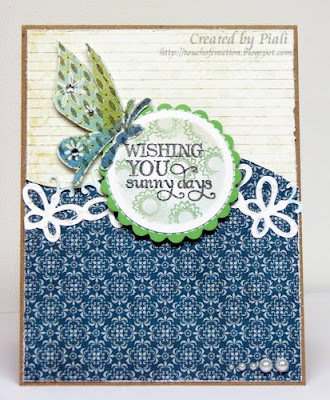 The butterfly stamp is from Basic grey...I heat embossed on the lovely Basic Grey ~Kisohi paper...love the fabulous shades of this paper collecttion. 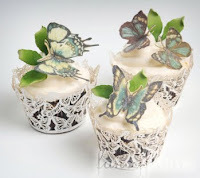 Love the cupcake wrapper...fab lace like butterflies..I used my Cricut to cut out a lovley butterfly border..
COLLEEN (out this week) , KAREN , KELLI , KRISTIN, MICHELLE, TERESA . Make a beautiful card where YOU create a scene of some sort. Using stamps or images that already have the scene created are NOT allowed! I used 3 Penny Black stamp sets and New Basic Grey ~Kioshi paper to create a cute Spring time scene..... good times with friends! PRIZE: $25 gift certificate PLUS FREE shipping! 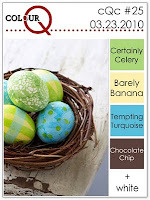 Secret Crafters Saturday challenge: SPRING HAS SPRUNG. Allsorts challenge:"Spring is in the Air"
Simon Says: Splash of Green. Flutterby Wednesday:Green+ butterflies, fairies or angels . 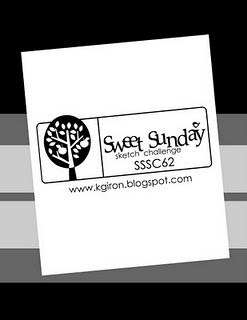 So play along with your stamps to create a scene...and make sure to post a direct link HERE..
Paper: Basic Grey ~ Kioshi, Bazzill. Copics, Pearls Sticker sentiment, white gel pen. Happy Friday!! Its been a very busy and crazy week for me....sorry for being such a bad blogger! 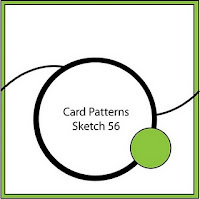 I have planned for few lovely cards but they're all in my sketch book only , hope to finish them soon. So join us to play along and win Buddy and Piper n Prince images as well as a $5.00 Gift Certificate to Cafe Store and a winner’s blog badge. The winner's blog will be featured in the Winner’s Section of TCC store . 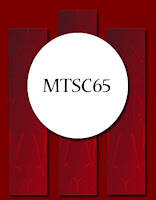 Make sure to check the Cafe Blog for all the lovely DT creations and link your project HERE by next thursday, March 25th. 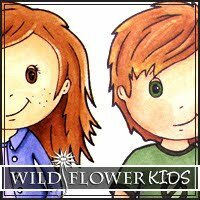 Its time for another WILDFLOWER KIDS WEDNESDAY CHALLENGE.. Yep!! Our challenge is to clean our crafting Stash ..use the scraps and bits...and make room of new goodies..thats what spring is all about New Beginnings, isn't it! Lots of new paper pads are available now so Jenn's challenge was so useful for me..now I've made room for more paper & stamps..lol. 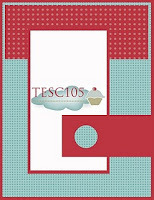 Papers: Scraps and K & Co, Bazzill cardstock. 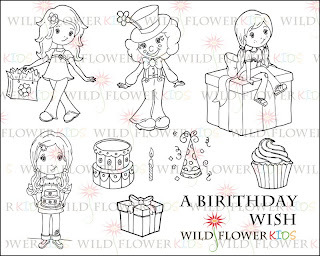 Stamp: Wild Flower kids stamp. Copics, Nesties,white gel pen, scrap ribbon, button. 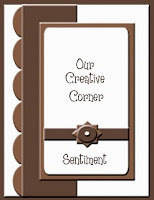 SPRINGTIME IN SASSYLAND Blog Hop.. If you are just joining me now..please go back HERE to start ..so you don't miss any stop.. Here is my Party Chick.....love this image ..absolutely fabulous!!! I used this week's PCP Sketch and One Stitch at a Time Challenge ~Card recipe for my card today..
Lindsay has some more SURPRISES for all of us...make sure to join us at SSD PARTY blog from 6-9 PM EST for lots of fun and chit chat..
Time for Stamptacular Sunday Challenge. 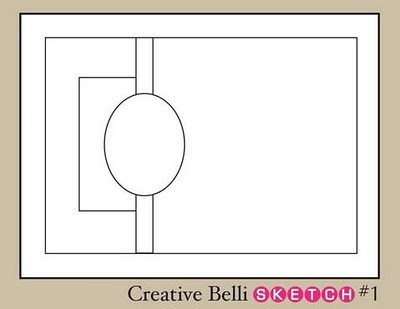 So Play along with this sketch and make sure to link your entry HERE..
Paper: Sassafras lass, K & Co., Bazzill. Copics, making Memories alpha chipboard stickers, Sewing Machine/thread, Recollections Bling Making Memories brads, Felt flower, PTI Vintage button. WFK All a Flutter Release and Challenge..